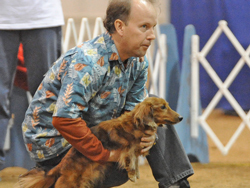 Rémy started agility class at Jump Start Dog Sports in June 2001 at age 3 1/2. 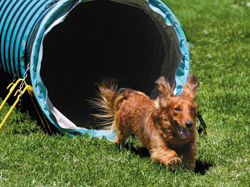 He entered his first AKC agility trial in December 2001 -- and was terrible! But with a little more experience and training, Remy got his first novice legs in May 2002 and both his novice titles in June 2002. 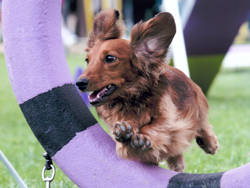 You can see some of Remy's early agility photos on the Doxi Fun Week page. 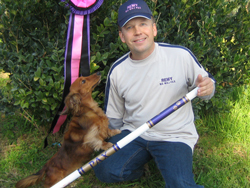 Remy earned his Open Agility title in December 2002 at the HIDAC trials with two perfect scores in Open Standard. He qualified in his first two Open Jumpers runs in July 2002 (this is easy!) -- then needed eight more runs to get his third leg and Open Jumpers title in January 2003. Remy got his Excellent Jumpers (AXJ) title in May 2003, his Excellent standard (AX) title in June 2003, and followed with his Master titles in late 2003. 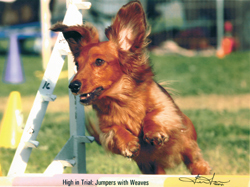 Remy was one of the top five AKC agility dachshunds in 2004 and was one of four dachshunds to qualify for the 2004 AKC Agility National Championships. 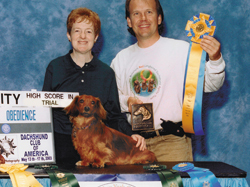 Remy won his first Dachshund Club of America (DCA) Agility High in Trial (Standard) award in Syracuse NY at DCA 2003. He followed that with another DCA Agility High in Trial at DCA 2004 in Riverside, CA, again in Standard. Remy and John worked hard on their Master Agility Champion (MACH) title, but Remy would frequently knock one bar on a course. They were making good progress towards MACH when Remy suddenly started having seizures in October 2004. Between the seizures and the medication, Remy struggled to compete at 8" and we moved him to Preferred agility in 2005. Remy finished his 8" career with 8 double Q's and 609 points towards MACH. You can follow his progress towards the MACH title on his Excellent B page. Remy started running in Preferred in April 2005. Despite struggling with health problems related to his epilepsy, he earned his Novice, Open, and Excellent titles quickly and started working towards his PAX (20 double-Qs) title in early 2006. 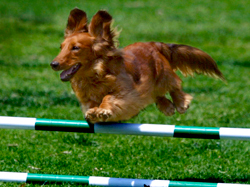 Although he still occasionally knocked bars, Remy was a steady and enthusiastic performer in Preferred Agility. Remy was always ready to run and loved nothing more than hearing "Ready" at the start line. He earned his PAX title on 27 January 2008 (watch the video!) and his PAX 2 title on 31 December 2009. See this video of John and Remy competing in northern California on 21 March 2009. This was the day that Remy earned his Preferred Agility Championship (PACH) -- but we didn't know it because the AKC did not award PACH titles until July 2011! Remy was the second dachshund to earn a PACH. He finished his career with 25 QQ's and 370 points toward PACH 2. 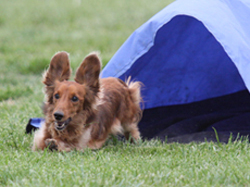 Even as a Preferred Dog, Remy placed in the DCA Agility Top Ten in 2006 (#7), 2007 (#3), 2008 (#8) and 2009 (#7). He also won DCA Agility High in Trials awards in Preferred at DCA 2007 (Dixon CA) and DCA 2010 (Riverside CA). We had to withdraw Remy from the 2004 AKC Agility National Championship due to the onset of seizures. So when Preferred dogs were admitted to the Nationals in 2010, we jumped at the chance for Remy to finally compete, even though he was 12 years old. You can see photos and video on the Remy's Last Year page.